JERUSALEM (Ma’an) — The Palestinian Authority Committee for Prisoners’ Affairs on Tuesday accused Israel of concealing a 43-day long hunger strike being undertaken by a Palestinian prisoner. Hanan al-Khatib, a lawyer with the committee, said the Israeli authorities had attempted to keep prisoner Muhammad al-Mahr out of the public eye by not notifying any of the appropriate Palestinian authorities that he was on hunger strike. Khatib visited al-Mahr at a hospital in Tiberias in northern Israel on Tuesday, where she said the man’s arms and legs were cuffed to his bed. It was unclear when al-Mahr was transferred from prison to the civilian hospital. Al-Mahr was arrested on Nov. 2 for alleged possession of a knife with the intention of assaulting Israeli soldiers near a military checkpoint in Jenin. He denies the charges and went on hunger strike to demand his release from Israeli custody. Palestinians regularly go on hunger strike to protest their prison sentences and conditions. 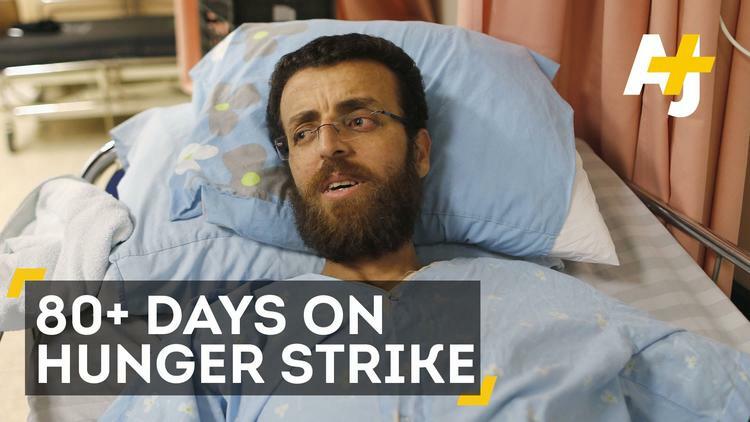 Muhammad al-Qiq, a 33-year-old journalist, has gained widespread attention for a hunger strike now in its 85th day that has brought him close to death. Another prisoner, Rabie Atta Muhammad Jibril, was moved on Tuesday from the Negev Prison to Soroka Hospital in southern Israel after he fell into a coma on the sixth day of a hunger strike. Both al-Qiq and Jibril went on hunger strike to protest their administrative detention — an Israeli policy that allows Palestinians to be held without charge or trial indefinitely. Israel has negotiated in cases of hunger strikes launched by Palestinian prisoners in the past out of fear that prisoners’ deaths could spark unrest in the occupied Palestinian territory, but there has been unrest in the territory for months now.